What is the most idyllic garage you could dream up for a McLaren MP4-12C? If you were thinking of a stunning mountaintop auto fortress, dare to dream, my friends. Go big or go home. 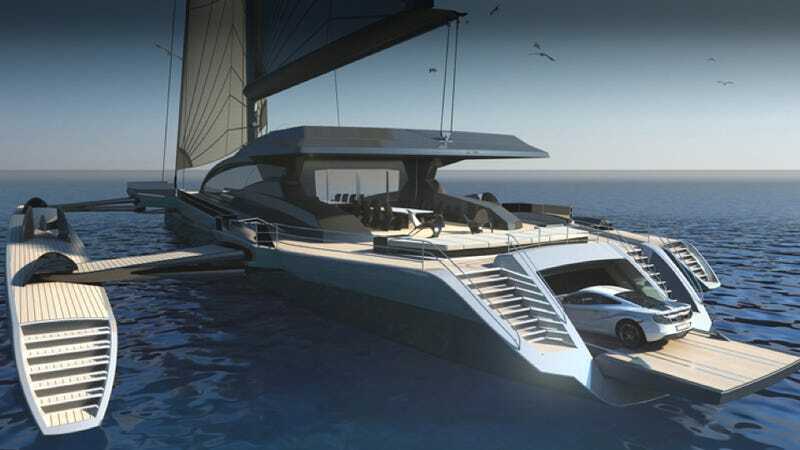 This is the CXL trimaran concept, the greatest garage ever conceived. Sure, it only fits one car, but it's a McLaren after all, and the garage is attached to this fantastic yacht. If you need to reach a mountain paradise or other inland pleasure spots, it's just a car ride away from any port. The 158-foot-long trimaran superyacht — which manufacturer UltraLuxum claims is the largest sailing trimaran in the world — features retractable outer hulls designed by McLaren Applied Technologies. Fully extended, the outer hulls stretch the yacht's beam (width) to 75 feet, providing greater lateral stability than you'd see in a monohull craft of similar proportions. That footprint would cause a problem at the entrances to many smaller marinas, so the retractable hulls collapse the boat's beam to 36 feet, which apparently is a bit more manageable. But if you get bored with the pool and the car and sunny weather and scores of bikini clad women that are bound to come with a lengthy time spent at anchor in nice place with a boat like this, you could probably take it out for a shakedown cruise someplace gnarly. You could, say, test the McLaren's tie down straps running the CXL through 50-foot swells in the Volvo Ocean Race. Good luck doing that without pitchpoling. I'll take the Mediterranean port and bikini bunnies, thanks.